Houston real estate conquers energy slump to complete its strongest year ever. According to the most recent Houston real estate sales data, Houston-area realtors sold a record number of properties in 2016. Despite the slowdown due to falling oil prices and resulting energy industry layoffs, the Houston housing market held steady throughout the year. The market gained momentum in the final months of the year (especially in December), setting a new record for home sales. While the numbers provide a good overview, a deeper look at Houston Real Estate Data By Housing Segments shows that the numbers are anything but “average”. Netting a 3% increase in single-family home sales, 2016 was a record year for Houston real estate. The graph above shows the trends for “Close In” Houston, MLS Areas 4,9,16,17,22,23,24 (about 15-20 minute commute from downtown). Leases of single-family homes rose 5.2 percent with average rent down slightly to $1,690; Leases of townhomes/condominiums climbed 9.5 percent with average rent up slightly to $1,497. 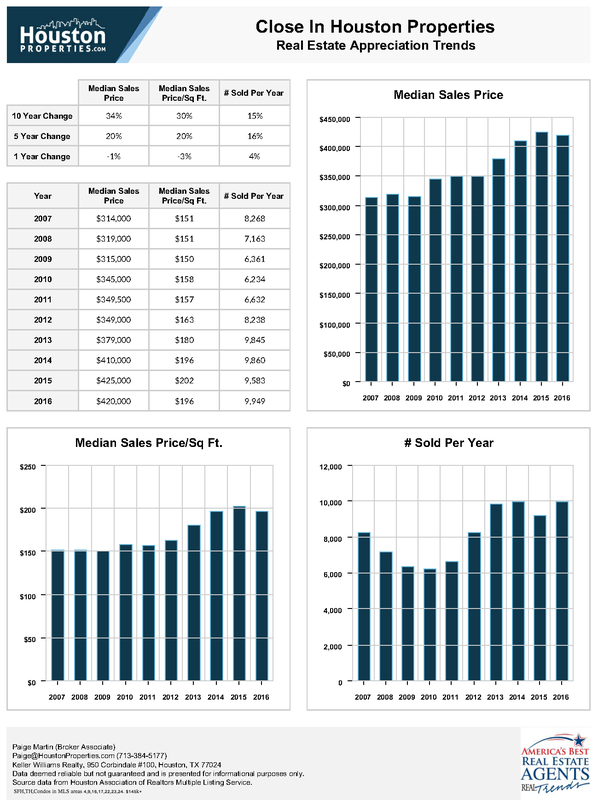 Get a full custom report of your neighborhood's real estate sales trends. Bonus: Also get a free review of how much your home is worth. While many economists predicted a slowdown during 2016 (thanks to falling oil prices and layoffs), the rebound the energy prices during mid-year 2016 sparked a resurgence in the market, especially gaining momentum (and setting records) during the 4th quarter of 2016. Note: much of the following text originates from the Houston Association of Realtors Newsroom. Homes priced at $500,000 and up, which experienced declining sales from August 2015 through October 2016 as a result of the energy slump, achieved an impressive turnaround with double-digit sales increases in November and December. Full-year 2016 single family home sales totaled 76,449, according to the latest report produced by the Houston Association of Realtors (HAR). This represents an increase of 3.0 percent from 2015 and is 1.3 percent above the previous record of 75,470 homes sold in 2014. Total dollar volume for properties sold in 2016 rose 4.2 percent to $24.5 billion. When 2015 segued to 2016, home sales had been on the decline as plummeting oil prices and energy layoffs sparked jitters throughout the Houston economy. But the housing market demonstrated resiliency, with sales up during all but three months of 2016. By the end of December, a record 76,449 single-family homes had sold. That represents an increase of 3.0 percent from 2015 and is up 1.3 percent from the previous record of 75,470 home sales set in 2014. Single-family months inventory* 3.2 3.3 0.1 mos.